When choosing Vinyl Resin , we will always see a series of technical indicators. What practical significance do these technical indicators have on the performance of vinyl resin? How can we see some knoledge from these technical indicators? Today Vinyl Resin Supplier will give you a detailed introduction. Most of them are 50% to 70%, 40% and 80% are also consumed. According to user's request, different solid content can be made. In general, high solid content is used for varnishes and varnishes. Medium solid solid solid paint, topcoat. Low solid content is commonly used in silver powder and primer. The size of viscosity shows the size of molecular weight. In order to ensure the performance of resin paint, the viscosity of thermoplastic resin should be higher (because it is volatile and dry). The control of viscosity depends entirely on the use and performance requirements of resin. For example, resin used for ink, especially silk screen ink, should have low viscosity and slow drying rate to prevent silk screen blocking. Transparent putty requires high molecular weight and high viscosity. Because of the need for thick coating, in order to prevent the precipitation of pigments and fillers. Under normal conditions, under normal conditions, low viscosity is used for varnishes and varnishes. Medium viscosity solid paint, topcoat. High viscosity is often used on silver powder and primer. Many users only seek immediate benefits, hoping that the greater the viscosity of the resin, the better, so that more solvents can be added to reduce the cost of paint. However, gloss, leveling, workability and miscibility may be sacrificed. The acid value of resin is also one of the important indexes of resin. Generally speaking, the higher the acid value, the stronger the adhesion to metal substrates, the better the wettability and dispersion of pigments, the higher the crosslinking degree and speed of paint, the more unstable the storage. Different uses of resins require acid value severely, such as resins for aluminium powder paints. The lower the acid value, the better. Especially for domestic aluminium powder, the lower the acid value of resins can prevent the acid reaction of aluminium powder and resins in the storage process, and affect whiteness and gelatinization. Therefore, the acid value of resin used for aluminium powder paint is generally controlled below 2 mg KOH/g. 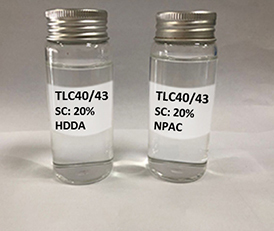 High acid value is required for blocking polish on the surface of electroplated metal to achieve better adhesion and electrostatic spraying effect.